We haven't talked nails in a while, have we? 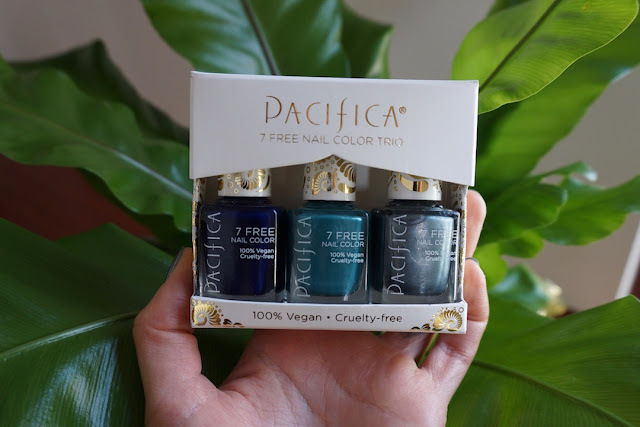 So i figured it was perfect timing to introduce you to some amazing 7 free polish shades from the beauties at Pacifica. This gorgeous little trio arrived at my door the other day and although they're not shades i'd typically gravitate towards, i ended up loving them. Not only are they shades i don't already have (from any brand) but the formula is beautiful. I love that the brush is flat but not overly wide so its the perfect shape for my nails. 2 coats gives a gorgeous opaque color but for a more intense iridescence from Star Dust Memories, i ended up with 3 coats and LOVED it. You can find these shades and more at Ulta for $9 each. A gorgeous, deep, dark purple toned blue. This would be amazing on short, neat manicures and even if you're not usually one for anything but neutrals, this one is very wearable and chic. This teal is very slightly muted and jewel-toned so would be complimentary on a lot of skin tones. It has a slight iridescence to it that just comes across as a sheen from far away. This was the one i was most surprised at how much i liked it. Its a cool green-based muted pewter (mutey pewtey from here on out) that really doesn't show its true beauty until the second coat. The shade sort of reminded me of my eye color since no one can ever agree on whether they're green, grey or blue so i really fell in love with this one even though i wouldn't have gravitated to the shade ordinarily.